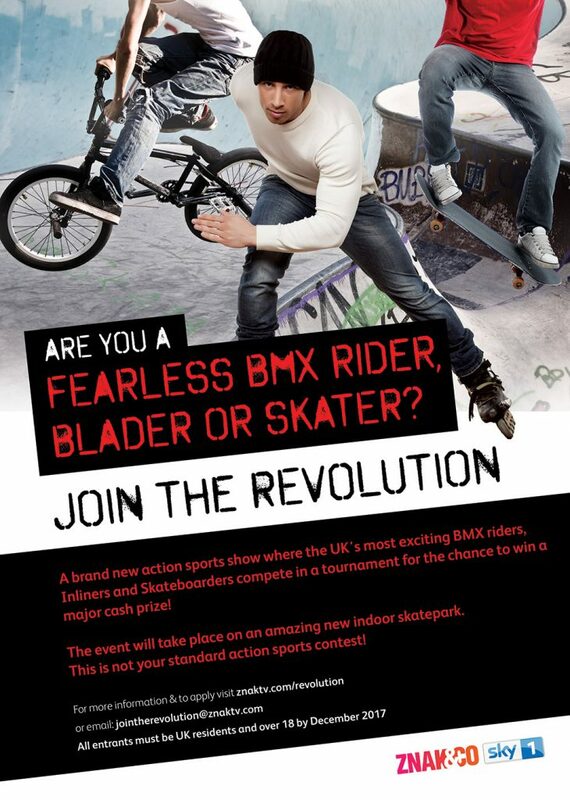 ‘Revolution’ is the working title of a new action sports TV show that is going to air on the Sky 1 TV channel incorporating Skateboarding, BMX and Rollerblading. Ok, before you stop reading we hear that it’s worth ignoring the terrible poster as the ramps and courses being built for this are going to be unlike anything anyone has ever seen before and sounds like it is worth considering! On top of that there is supposed to be a pretty major cash prize involved as well. If you are up for riding stuff like pump tracks, transition, jump box kind of stuff then this should be up your street! There are tryouts at a few skateparks in the UK and Unit 23 is the only Scottish one on the 6th September (very soon! ), note that there is an age restriction so you need to be 18 by the 1st December 2017. To apply just go to znaktv.com/revolution, read the T&Cs and fill out an application form.